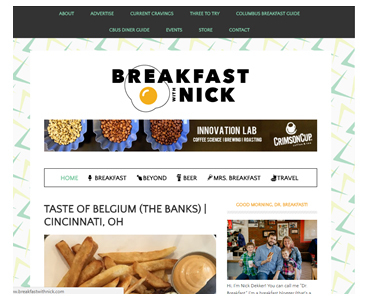 Several years after creating his blog Breakfast with Nick, Columbus blogger Nick Dekker now breaks 100,000 pageviews per month. Columbus blogger Nick Dekker started his blog Breakfast with Nick in 2007 as a hobby. He grew up loving breakfast and started the blog as a way to remember the places he’d been and his experiences. Dekker now breaks 100,000 pageviews a month on his blog, has more than 11,000 followers on his related Instagram account and receives requests for sponsored content. He also published a guidebook to breakfast in Columbus in 2011. What skills do I have (i.e., writing, editing, photography, technology)? Just like other platforms, blogs should define an intended audience (or two or three, but that’s about the max). For Dekker, this audience is anyone living in Columbus or traveling to Columbus. “I always think of people in the city and helping them discover a new favorite spot, get to know new places that have opened or rediscover an old favorite,” says Dekker, noting the trend of using food to get to know places. With that audience in mind and knowing that 75 percent of his readers live in Columbus, Dekker uses his blog to help readers discover local food and things to do. This means he also provides images, addresses, websites, dietary restrictions and other logistical information since his readers often rely on the blog to find new places to eat. In the video below, Dekker talks about the importance of finding a niche and establishing a trusted voice in that space. Breakfast with Nick blogger Nick Dekker talks about blogging. Dekker says he follows advice he received early on from a fellow food blogger: the best thing you can do for your readers is to be honest and consistent. “If I gush about every place I go, it won’t seem honest. Having a trusted voice has helped me build a readership,” says Dekker. The voice in his blog – laid back, honest and passionate about food – built a niche that set Dekker apart from other resources offering formal culinary instruction or restaurant critiques. Lauren Powers runs Columbus style and travel blog An Explorer’s Heart. She notes that a defined target audience is also helpful if the goal is to monetize the blog because brands appreciate knowing who you’re targeting with the content. Polaris Fashion Place, AMC Theatres and Modcloth are among the brands that sponsor Powers’ posts because they’re interested in the target audience she reaches. 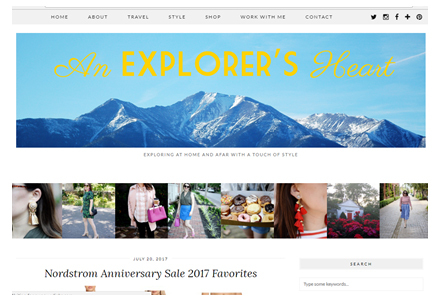 Local blogger Lauren Powers rebranded her blog into An Explorer’s Heart to focus more on her key topics of style and travel.